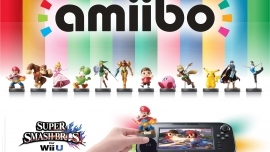 Exciting news today for you guys: we have received a review copy of Super Smash Bros. for Wii U and an amiibo figure! Our editor in chief Nate received it in the mail and decided to do an unboxing video. In the video he goes through what we received (obviously) and other goodies too. Be sure to check out the full video, and make sure to subscribe to our Youtube channel where Smash videos will most likely be posted in the near future.